Oh wow, look at me. Way late again! It’s been months. You guys watching “The Good Place?” I’m not. It just feels like something to start a conversation with instead of “How about this Kavanaugh appointment?” All monumental injustices aside, I hope you’re doing well! I’m mostly emailing you to let you know that I’m alive, well, and working. And I’ve gone 386 days without getting hit by a car! 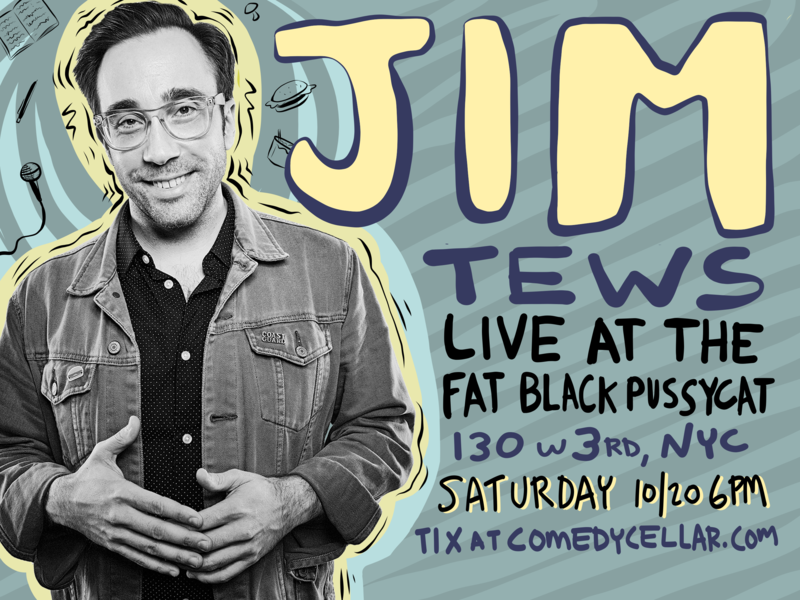 I’m doing a headlining show at the Comedy Cellar’s Fat Black Pussycat Lounge on Saturday October 20th. Get your tickets here before they sell out. This is worthless information if you’re not in NYC, so I'm sorry you had to read about it. You’re probably like “I should just move to New York City, the second most expensive city in the country, to see Jim do a bunch of stuff I’ve never heard before for one night.” If you’re thinking about doing that, that’s really great. A little intense, and probably not very rational, but I don’t want to stop anyone from pursuing something that seems abnormal. I’d encourage it. It’s really the best way to learn about oneself. So move to New York and come see my show if you don’t live here already. If you’re in the Denver area, I’ll be coming to Boulder, Denver, and Fort Collins the first weekend in November. You can check my site for details and ticket links once they go up. If you’re not in the Denver area, I guess you could move there too, to catch my shows. It’s a beautiful area, and there’s so much weed. Like, maybe too much weed? I'll find out for sure. Thanks for subscribing, and don’t forget to vote exactly how I would on November 6th. And come to a live show!